Opening up on Earth 3's Krypton, 25 years ago, Jor-Il and his wife destroy all of the escape rockets off of Krypton. All but one. They put Kal-Il into a rocket and send him off, training him to be evil as he grows on his journey to Earth. There, he forced Jonathan and Martha Kent to be his new parents, at least until he turns 7 years old and kills them. He grew up and used people like Hal Jordan and the Amazon Lois Lane to his advantage, creating the Crime Syndicate. That is until Darkseid came to their Earth and destroyed it. And then they came here. 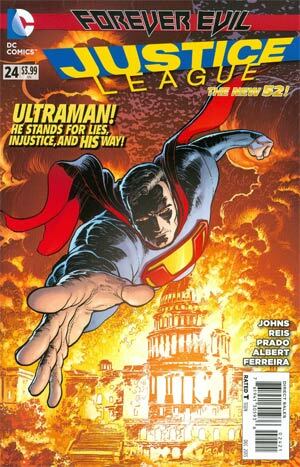 Ultraman flies to Metropolis's very own Daily Planet building where he finds Jimmy Olsen. On his world, Jimmy took dirty pictures and fought people for doing him wrong. But that is not this world's Jimmy Olsen. Ultraman breaks Jimmy's hand, throws Lois Lane across the room, and tells Jimmy that Superman is NOT coming. Lois tries to fight back, but Ultraman continues to remind them that Superman is NOT coming. Grid gets on the line with Ultraman telling him that a threat is headed towards him; a threat in the form of Black Adam. Adam explains to Ultraman that he has spent his life liberating people from those who would rule over them, but Ultraman tells him that he doesn't break easily. 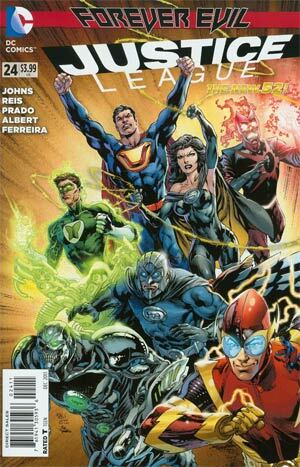 Story - 5: What a great way to bring back the Justice League book after the events of "Trinity War", Forever Evil issues #1 and #2, and Villain's Month! 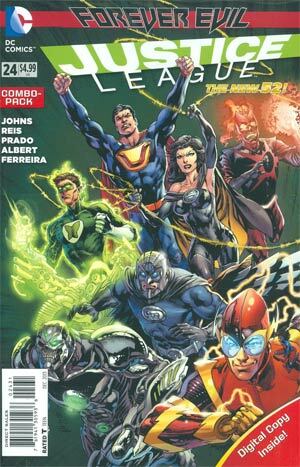 For those thinking that this issue of Justice League is a Crime Syndicate-centric issue, it's actually not. Rather this issue is really a look at how the people in Superman's life are reacting to the events of "Forever Evil" as well as a deeper look into Ultraman, who he is and what his world is like. The interesting thing about Earth 3 is that, generally speaking, they are not actually exact doppelgängers of their New Earth counterparts. Actually they are really just products of a warped universe where things turned out differently since the beginning. Ultraman is not Superman, nor is he Kal-El. He is Kal-Il. Superwoman is not Wonder Woman; she's actually an Amazon version of Lois Lane (how that happened I still couldn't tell you). Owlman is actually Thomas Wayne Jr., not Bruce and Johnny Quick is not Barry Allen aka The Flash. The only one who is relatively the same as his New Earth counterpart is Hal Jordan, but unlike the Green Lantern that we have been rooting for all these years he is the fearful Power Ring. It's very interesting to see how differently things could have played out had someone not made the right choice. That being said, I love how Superman-centric this issue is! First off, Lois is writing the ending to "Forever Evil" as it is beginning as she writes about how Superman came to save the day (which at this point we can only hope will be the case). Jimmy is defending Superman, as always, saying that he is alive and that the Justice League is not all dead. Before I move on, I want to ask a question. How old is Jimmy supposed to be in the New 52? According to Action Comics, if I remember correctly, he is about Clark's age. However, in both Andy Diggle & Tony S. Daniel's short-lived run on that book and in this issue of Justice League, he looks significantly younger. This could easily just be an art issue for sure, but I'm wondering if the intent was to make him young again so people would know who he was? I'm honestly not sure. Regardless of that, I loved Jimmy's role in this story! I thought it was great that he didn't give up hope (because why would he?) and he continued to insist that Superman was still alive and would help. But apparently, his Earth 3 counterpart is a sleazebag and a villain in the same vein as Ultraman. The thing that shocked me about this issue was that when Ultraman found out how much of a "straight arrow" Jimmy was, that he immediately proceeded to break his hand (and camera). Obviously Lois had a big role in this issue as well as she also did not give up hope. It was very interesting how much Ultraman hates Lois in general, a clear parallel to Superman's love for Lois, but up until this point hasn't been able to do anything about it because his Lois is the only one on Earth 3 suitable to give birth to his child. This Lois however, he just throws across the room and as he says, "Lois... I can do whatever I want with you". Creepy. Briefly I would like to touch on Grid. Grid is the computer virus that literally ripped itself off of Victor Stone's body and became its own entity, leaving the now only human Cyborg to die. I think Grid had its own motives. I don't think it is a team player and will just work willingly for the Syndicate. I think there's something else going on there, but I don't know what yet. Then there's Black Adam. If you have NOT read Justice League of America #7.4 (which is possible if you have only been reading Justice League), it is a must read in order to understand how Black Adam has returned. As I'm sure most of you remember, back in Justice League #21 Shazam (I really HATE calling him that... He's Captain Marvel gosh-dangit!!!) fought Black Adam and when Adam finally surrendered he reverted back into who he was before he gained the Wizard's power, and since he was so old due to living so long, he turned to dust. Well, in his "Villain's Month" issue, to keep this short, he was brought back via Ancient spell. I love that Black Adam is a "liberator" so-to-speak. He doesn't like seeing countries or nations, or in this case the world, under the control of another; in this case, Ultraman and the Crime Syndicate. I look forward to seeing how this fight plays out in Forever Evil #3. Ultimately, this was a very good issue of Justice League, from the writing to the art to the cover, everything about it was something I liked and something that intrigued me. I want to give a special shout out to Ralph Silver for handing me the reins on this book, I'm extremely grateful, and definitely go check out his reviews of the new series Superman/Wonder Woman, which is actually a good book. Ralph does a great job and I have a lot of respect for the guy, so please send him some love. Be back next month for Justice League #25! Art - 5: Ivan Reis is one of my favorite comic book artists. He draws a fantastic Green Lantern, a heroic Aquaman, and a marvelous version of the Justice League. That being said, he also draws Ultraman and the rest of the Crime Syndicate extremely well and I hope he continues to draw Justice League for as long as he is able. Cover Art - 5: I thought this was very cool. I really did, I loved this. 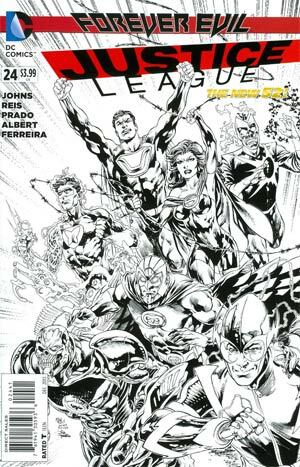 Not only is this cover a nice parallel to the New 52's opening book Justice League #1, but it also adds some characters that maybe shouldn't be there, like Deathstorm (taking Aquaman's spot as the Earth 3 Aquaman is dead) and Atomica. Either way, I really liked the cover. The only thing that could have made it better is if they had written "Crime Syndicate" over the "Justice League" title, but all-in-all I'm totally fine with the outcome. Cover Art - 4: This cover by Aaron Kuder is a very good idea. I like the idea of Ultraman burning the White House (especially since we find out that on his world he did) as well as the caption telling the reader what Ultraman actually stands for. Very cool stuff.